We are the leading manufacturer and supplier of Plywood Crates for Packaging Use to our valuable clients. We are one of the well-known manufacturers and suppliers of Plywood Crates for Packaging Use. The offered plywood crates for packaging use are very widely used in the industrial sectors, for packaging and transporting goods and materials. 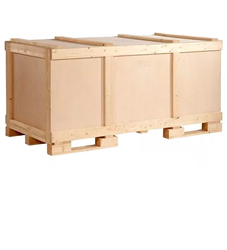 Our supplied plywood crates are made from superior grade raw materials, which can withstand for long duration of time. The offered plywood crates are available at very cost effective market rates.